Se sugiere que la interfaz o microgap entre el implante y el pilar tiene un efecto perjudicial sobre el nivel ósea marginal. “There is no indication that AgNo3NH4OH solution entered the space between screw (Right Picture), abutment and implant (Left Picture). No gap was found at screw/abutment or abutment/implant interface”. No hay ninguna indicación de que con un torque de 30Ncm la solución AgNo3NH4OH se filtre en el espacio entre el tornillo de la foto derecha, pilar y el implante de la foto izquierda. No se encuentra gap entre el tornillo/pila o interface pilar/implante. 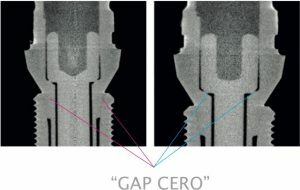 “However, if only applied torque is analysed, the lower levels of microleakage occur in 30 Ncm tightened abutments, where, as shown in the photomicrographs, the gap is virtually nonexistent for Morse tapes connections and external connections get an almost perfect seal. This may be due to the strict manufacturing criteria found in the analysed elements”. 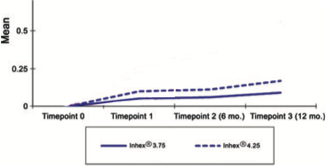 “…Global mean marginal bone loss with Inhex® was 0.07 ± 0.13 and 0.12 ± 0.17 mm. as determined 6 and 12 months after prosthetic loading, respectively…”. La pérdida media global del hueso marginal con Inhex® fue de 0.07 ± 0.13 y 0.12 ± 0.17 mm. como se determinó a los 6 y 12 meses después de la carga protésica. Peñarrocha Diago, Miguel et al.